I love all Asian food. It's definitely one of my favorite types of food to eat. This recipe is based on a Chinese food recipe I found on Pinterest but I changed the original recipe a little to make it easier and more budget friendly. 1. Begin by cutting chicken tenderloins into smaller pieces and starting cooking the chicken in the sesame oil on medium/high heat. Add in frozen broccoli and carrots after chicken begins to turn white. Add minced onions and continue to cook on medium heat. 2. While chicken and vegetable are cooking, fill a medium sized pan with water for boiling. 3. Next create sauce. Combine worcestershire sauce, soy sauce, ketchup, sugar, sriracha, and ginger. Stir until completely mixed. 4. Add ramen noodles (without seasoning packet) to boiling water and cook for about 5-6 minutes or until tender. 5. 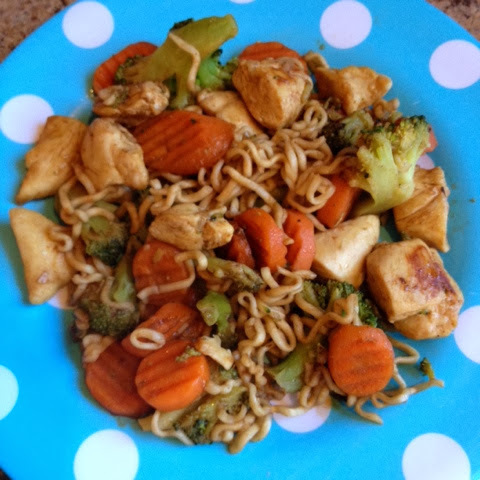 Combine chicken and vegetables (when tender) with the ramen noodles (if noodles seem sticky add a small amount of sesame oil to the noodles) and mix in your sauce. Looks tasty! This will be dinner inspiration later this week :) I actually have dinner planned tonight, woah.